We are making a big effort to do more writing but we are trying really hard to find fun ways to work on the writing. My oldest has gotten into writing book summaries for all the books she reads and even character descriptions of the main characters (the ones she likes) but my youngest is never really keen to try that. I have noticed that he loves creating little rhymes and changing the words of songs so I thought possibly some poems might be something fun to do with him. Now I must be upfront about something, as much as we read (and we do read lots) we don’t really do lots of poetry, at all. So I decided to start with some Acrostic Poems – poems where the first letter of each line spells out a word. Acrostic poems can rhyme but they don’t have to so I hoped it would be a good starting point for us. I printed out a few templates from Activity Village and the kids honestly jumped right in. My son started with a spider poem – he loves spiders – he calls them the king of creepy crawlies, so it was a great starting point for him. While he was busy with his spider poem his sister had a go at a Rainbow Acrostic poem. I actually think the Rainbow Acrostic poem is a brilliant one to start with. 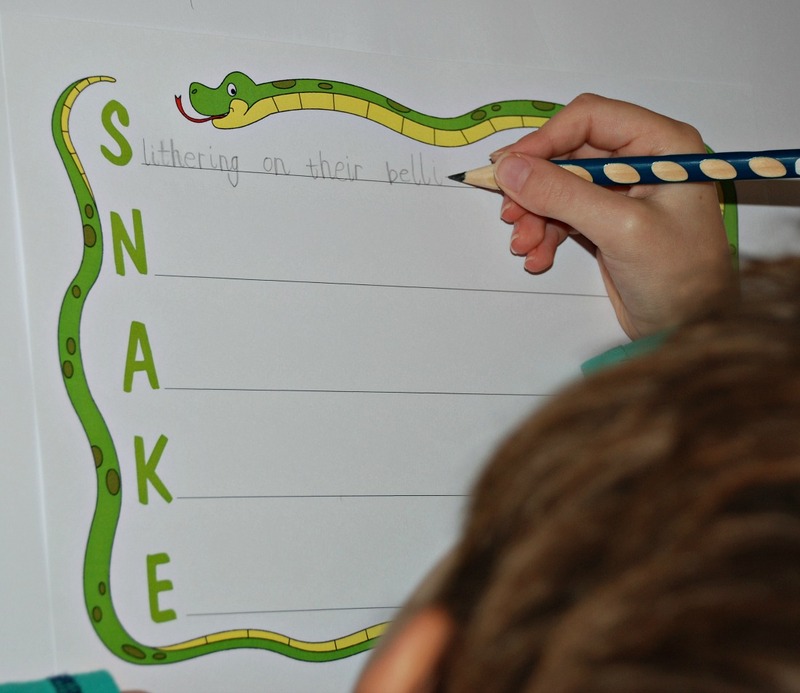 It seems to naturally lend itself to a writing activity as the kids can write about all the different colours of the rainbow, how it appears after rain, even the gold at the end if they wanted. Both of mine seemed to really enjoy the rainbow one and had so many ideas of things they could include. With this poem writing – I was really just wanting to encourage a fun writing activity so I did not make a deal about handwriting, punctuation with my youngest as I know that would just put him off. I really am just wanting to get him writing more and writing in a fun way that he enjoys. The kids also had a go at writing an Autumn one. I really did not know what to expect when I suggested we try writing some Acrostic Poems but both my kids seem to really enjoy the idea and sat for well over an hour creating multiple poems. My youngest is keen to try a few more of the animal ones and apparently this time he wants to see if he can introduce some rhyming. Important to Note – we did have a bowl of popcorn on the kitchen table that the kids were snacking on while writing their poems – my son tells me this is necessary for good poem writing. And I must admit after the lovely afternoon we had I am definitely going to put out more popcorn next time we try to write poems. 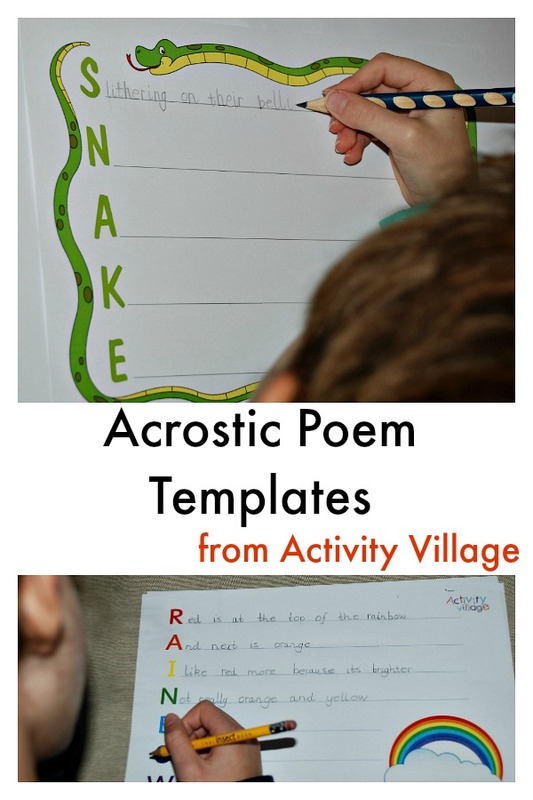 This entry was posted in Homeschooling and tagged Acrostic Poems for kids, activity village, english, home ed, home education, homeschooling, Poems. Bookmark the permalink. Fun pages for poetry and popcorn is always a winner at my house.